Through Digital-in-a-Box, PurpleClick provides both an optimised e-commerce site and the necessary skills for SMEs to manage their portfolio of digital assets in a smart and efficient way. The battle for eyeballs in the digital marketing space is creating a huge challenge for businesses to catch even three seconds of attention from overwhelmed Internet users. This is where PurpleClick Media comes in. The digital market agency has established itself as a specialist in performance-driven digital solutions, with its expertise in Search Engine Marketing (SEM) and Search Engine Optimisation (SEO). The company maximises marketing dollars by delivering the right advertisement to the right person at the right time and even to the right location. Over the past 12 years, it has serviced numerous entities, from SMEs to government agencies, by meeting business objectives in a cost-efficient, solution-oriented and high-quality manner. The fast pace of innovation and technological changes makes it hard for any company to master the art of digital marketing. Yet PurpleClick is constantly evolving and looking for ways to provide companies with the most up-to-date digital solutions. Aware that personalised solutions are matched with higher demand, the company places a strong emphasis on customised client services. "The days where a one-size-fits-all solution across different industries are long gone," says Stanley Tay, chief executive officer of PurpleClick. This year, the company launched Digital-in-a-Box (DIAB), a marketing solution jointly supported by Google and its partners. The programme helps companies to launch an e-commerce website, and is packaged with a customised digital marketing solution. This is in alignment with the government's aim of supporting Small and Medium Enterprises (SMEs) to scale their business capabilities online. Years before digital marketing became a prominent business tool, Leonard Tan, founder of PurpleClick Media, identified the potential of search marketing for SMEs, launching the firm in 2006 in the back of a shophouse in Temple Street. Apart from financial constraints, the company was confronted with the challenge of promoting the idea of digital marketing and convincing clients of its benefits at a time when businesses needed to see their ads in order to make sense of their marketing dollars. However, with grit and passion, PurpleClick managed to overcome these obstacles. To date, PurpleClick has delivered strategic marketing campaigns for SMEs and Fortune 500 companies, garnering them over 30 awards. "Right now for the retail industry, digital marketing is still mainly used to promote the brick-and-mortar businesses. But, e-commerce is happening now and is changing businesses as we know it" says Mr Tay. Anticipating that SMEs will leverage on the benefits of a cost effective and operationally efficient e-commerce platform is what prompted PurpleClick to collaborate with Google and Enterprise Singapore to offer the DIAB programme. PurpleClick recognises three critical challenges that SMEs face in taking their businesses online. First, they lack a functional website due to budget limits. Second, they lack the time and patience to engage a good Web developer. Third, they do not have the knowledge to create a well-optimised site that sells for them on a 24/7 basis. "We want to take them past these initial obstacles," says Mr Tay. With this vision in mind, DIAB is designed to provide SMEs with a holistic package that gets a company rapidly online and making sales. A good e-commerce website should be user-friendly and draw quality targeted Web traffic to the site. This is where the DIAB programme comes in - The website enhances user experience and is SEO-friendly. It is complemented with a personalised digital marketing plan, which makes DIAB more holistic and effective for the retail businesses. In addition, PurpleClick provides training sessions to ensure that its clients can operate their e-commerce sites independently beyond the DIAB programme. In addition, PurpleClick is looking to disrupt the existing customer online experience with the use of Virtual Reality in the property and home furnishing industry. "With an exponential growth in this industry, we want to take it a step further by providing online searchers an entirely immersive experience into what they are looking for," says Mr Tay. With this in mind, PurpleClick has partnered with companies to incorporate 3-D Virtual Reality technology on their websites to fully showcase home interiors, landscapes and furniture designs. This aims to enhance the user experience and deliver greater customer retention. Firms in this industry can leverage the immense opportunity that digital marketing offers and see improved business results. Using this as a starting point, PurpleClick is looking towards adopting Virtual Reality technology into its line-up of digital solutions. 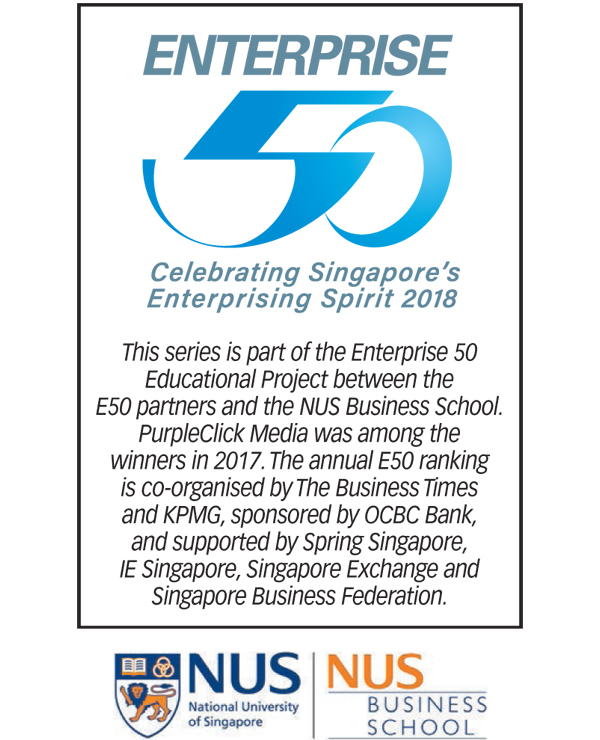 The Enterprise 50 awards is a new breakthrough that celebrates its achievements, and the company is proud to be ranked 30th among the 50 winners despite being a first-time applicant. In addition, PurpleClick won Gold in Marketing Magazine's Search Marketing Agency of the Year award in 2017, a first for the company in this global category. As advertising is increasingly anchored in the online space, PurpleClick hopes to create greater value by offering in-depth specialised services to specific industries. DIAB and the use of Virtual Reality technology is setting the stage for PurpleClick to bring faster, better and more innovative digital solutions to its clients. "Things are changing very fast," says Mr Tay. "We are all still learning and continually reinventing ourselves ahead of trends to always be of value to our clients." The writers are students at NUS Business School.